Thanks for the opportunity to join. I do CNC work and build CNC machines but don't know an awful lot about auto mechanics or tire sizes. On my little farm I have a foreign-made rototiller(BCS) with weird sized tires that I just know are going to be special-order super-expensive. Haven't heard back from the manufacturer yet. The tire size is "3.5 - 8 TP B16" Will 4.80/4.00--8 tires by chance fit on the rims and work? Thanks! Can you just take the wheel or wheel with tire on it to an equipment place to match it up and order correct tires both size and tread you need for a particular machine will matter. Just went thru hell with a thing of my own with exactly the second size you wrote was for a commercial lawn mower so had "turf" treads not to destroy a lawn so little actual traction but not just bald. Never owned a "roto-tiller" but imagine you want aggressive tread and note they may also be directional but not say so on tires. This slow equipment actually can come with a freeze resistant sealer one brand name is by Slime. That can be good stuff for non automotive use as it doesn't freeze, isn't corrosive and seals minor leaks and imperfections. Decide if you wish to go with tubes or go tubeless and I prefer tubeless. Reasons for either but IMO and experience if in a jam you are more likely to fix a tubeless and save the day and job then with a tube I find break off the stems so no real fix for that. Do you have tire irons and stuff to change these yourself? Small is difficult to almost impossible without some small tire tools. Whacked but some cheap drum brake adjuster "spoons" they are called can help, irons a must and would use a heavy rubber mallet. Another thought - Check on places like Harbor Freight, Home Centers like Home Depot, Lowes and others for whole wheels exactly like yours ready to go totally! You said you weren't a mechanic (yet) but will be. Know that a freaking flat on equipment, even a flipping hand truck is a royal pain in the azz and handy to know how to fix them! Check YouTube for some idea and demonstrations too. Google out the "Slime Product" and use just some not a lot. TWO TYPES - DO NOT USE THE ONE FOR TUBE TIRES!!!!!!!!!!!! I have a 29cfm 7.5hp in my shop so it should be able to seat the tires no problem. I had bought new tubes for these tires, but when i inflated one, discovered the tires were rotten. So, if I get the correct tires, may not use the tubes. Slime sounds good. Will try that. Slow day here and if you can read I can type away. Do know that if you get new ones for small equipment they will probably be shipped so flat sideways that makes them a serous pest which is what a "tire strap" either inflatable or just a good rope or a material like a belt or your imagination to squish the tire to you can feed a tube inside or just get it close to rim so when you add air it jump to the rim not just blow air or a tube out like a hernia! Do check tire pressure often with equipment and again right before use after a year of down time. Same bull in my life - snows here so stuff for that and in season mowers, trailers and assorted crap I can't just send all that out would take longer than doing it for me. Have a couple pressure gauges. For some bucks they have ones for wet filled tires too - ask at like a real parts store like NAPA. Get a couple cheap tire gauges and you need a Schrader tool or buy tire valve caps with them to remove Schraders. Understand what they are. You take those out so air blasted really BLASTS in hard for setting tire on rim then put the Schrader back in. Sorry - this is common know how if you ever owned a bicycle and fixed flats but have to mention it if you don't. You are soooo right. My own stuff the rubber rots not wears out! That is still a problem for when you need some damn thing to work. Try a dang wheel barrel full of dirt with a flat! Nah - they make flat free solid foamy ones for those and worth it. More and going a bit redneck if you will. For small tire tools like tire irons you can smooth out and bend screwdrivers, pry bars to work as well as throw away flatware dull knives use the handles - grind with a grinding wheel as needed, heat and a bench vise a must you can make what you need. You don't want to use things that will harm, cut the tire, a tube or the rim. BTW - for lack of proper rubber lube use common dish soap diluted! Do NOT use any petroleum greases - they wreck rubber! The best reason to know how to do this yourself if more than one machine is so you don't just spend all day looking for what you need when you need it NOW type stuff never mind the money. One more: If tire is stuck to rim use the rubber mallet and a real dull wide screwdriver or other to "break the bead" I'll call that. Thanks! Lots of good info there! The tire size is "3.5 - 8 TP B16" Will 4.80/4.00--8 tires by chance fit on the rims and work? Thanks! There is no way on the basis of strength alone. 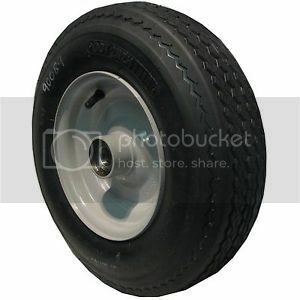 That 4:80X8 tire is a 2 ply tire used for hand dollies, roll around shop equipment and wheel barrows. Definitely not strong enough for agricultural applications. That's not what i was expecting to see.